The F-86 is one of those planes that just seemed to have gotten most everything right, all rolled up into one package. It was well armed, handled fairly well and for the time, it was fast. It was also able to be upgraded and served in the air arms of dozens of nations. One of those nations, and one of the two who license built them, was Japan. 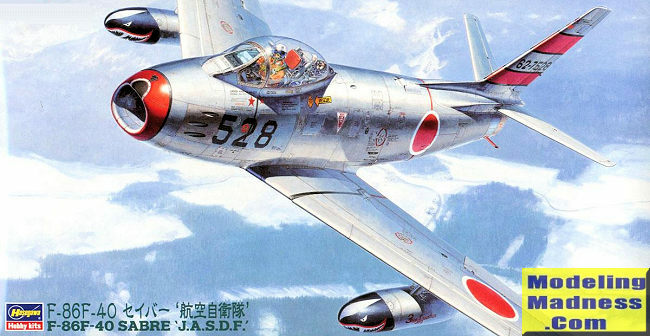 Japan chose the F-86F-40 version that had longer wings and reverted back to the slats for lower speed handling. The longer wings added to the aircraft's lift which benefitted turning and provided, along with the slats, a lower landing speed. While the 20mm cannon was becoming the 'go to' armament, the .50 calibre Browning was still potent enough in most cases. Japan's Mitsubishi-built -40s were also wired for Sidewinder missiles, though the early Sidewinders were not very reliable. Such was the popularity of the aircraft that they remained in service for many years in the trainer and hack roles. They also served with the Blue Impulse years after they were gone from regular service. The quickest way to tell a Mitsubishi built F-86F-40 from a North American built aircraft is that the Japanese version has a UHF antenna on the upper nose. Many of these planes were later recycled for drones and other auxiliary services, or ended up in civilian hands for those wealthy enough to afford a jet warbird. It is probably not surprising that the first of their Sabre family that was released was the Japanese F-86-40. This aircraft differs from most 1/48 Sabre kits by offering the longer -40 wing. The Japanese Sabre also had an additional scoop on the right side of the fuselage not on the US versions. This version also was able to carry Sidewinder missiles on the inner pylons. Japanese fuel tanks did not have any fins on them, something else that is different. All that is covered in this boxing. Now, if you have every built any of the other boxings, you' will find the kit to otherwise be the same. Hasegawa provides a nicely done cockpit with a decent ejection seat an instrument panel that uses decals and raised detail on the side consoles. A resin set will give you more detail, but this is perfectly adequate for most. A pilot figure is also included. You get a full intake trunk that ends in the first compressor stage. The nose gear well attaches to the underside of this and the cockpit to the upper side. This is all placed into a fuselage half along with the built up exhaust section. 5 grams of weight is needed to prevent tail sitting and there is plenty of space for it. I like that the intake piece is separate and if you don't like filling seams on the intake trunk, a cap for the intake and exhaust are provided. The wing is a full lower section with the main gear wells built into place with separate upper halves. Be sure to open the holes for the fuel tanks and the missiles. 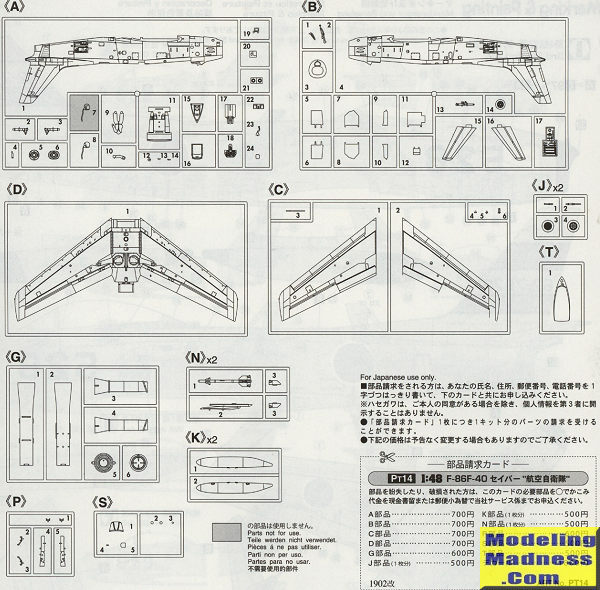 Unlike many Hasegawa kits, this one does include the missiles. Landing gear are very nicely done with the main wheels being in two halves. The wheels for JASDF Sabres seems to be a different design than for US aircraft and some even had a solid disc for the front wheel. The fuel tank pylons include anti-sway braces and the fuel line runs into the pylon. Sidewinders have two separate fins. You have a separate windscreen and canopy and can pose the canopy open if you so desire. Speed brakes can also be posed open if you wish, but you'll have to trim them to get them to 'hang' properly if modeling them open; they do not deploy straight out. Instructions are great and provide Gunze paint references. Other than the very earliest planes, all Japanese Sabres were painted aluminum. 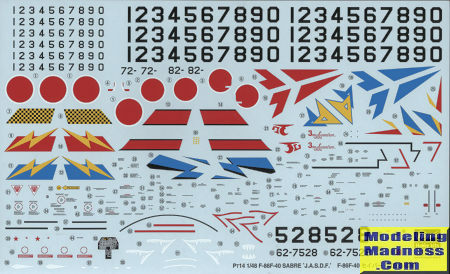 You are provided a huge decal sheet that provides sufficient markings to do any airplane for which you have a photo. The only set of serials/nose numbers ready to go are for the box art plane. However, you are provided images for all the other units if you want to use those. Since the decals are fresh, there should be no issues using them. In addition to being able to build a Japanese Sabre, this kit would be a good basis for any long wing F-86F. Of course, you will need to make some modifications to do others, such as removing and filling in the right side fuselage scoop and you may have to find some aftermarket wheels. However, if you want to do, say a Pakistani F-86F in this scale, this is the kit you want.